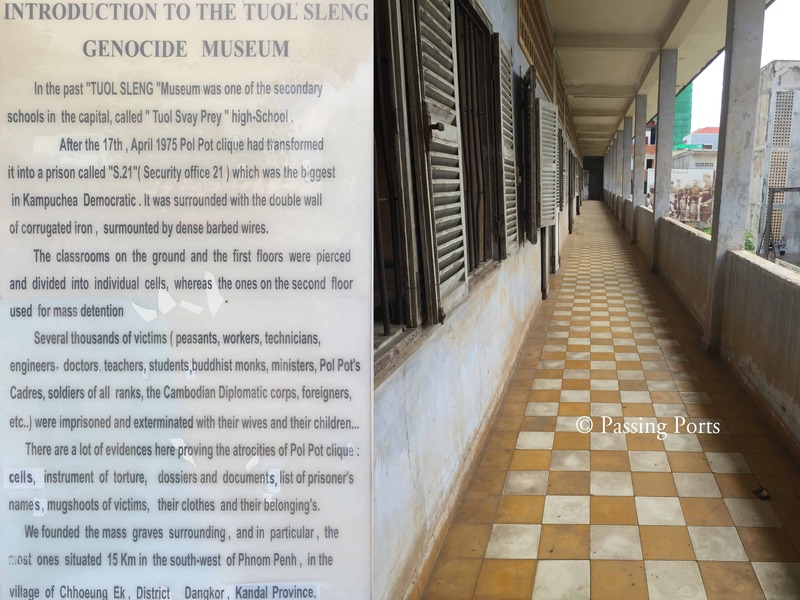 The Killing Fields and the S21 prison in Phnom Penh projects one of the worst genocides in world history. A lot of time has gone by, but there is still so much darkness from the past that prevails in these two places. A past that can never be ever erased no matter how many ever years we travel into the future. The stories you will hear are dark; darker than you can ever imagine. You will have moments when you suddenly feel a gush of chillness running down your spine, a heavy heart which feels like you cannot carry it any further, a ray of light suggesting that you are so lucky with all the problems you have. There are many places in the world that represent beauty in a myriad of ways. Think about them now. Imagine the worst that can happen in that beautiful place in your head. Phnom Penh’s Killing Fields and the S21 prison is all about that. Take a deep breath before you read any longer, the story doesn’t get any better. Extreme control and radical ideas led to millions of deaths during these four years. The Khmer Rouge used to tell their countrymen that they had to go to a different village/city for work, and leave all their belongings since they would return in 3-4 days. The ones who obliged – women, men, children and the elderly were all killed. The ones who did not oblige were killed on the spot and their houses were burned. Those who escaped this ordeal were sent to work in farms, which was not easy to survive. Apparently the Khmer Rouge led by General Pol Pot wanted to create a agrarian movement. Truck loads of people were brought to this field in Choeung Ek and placed in detention and killed. 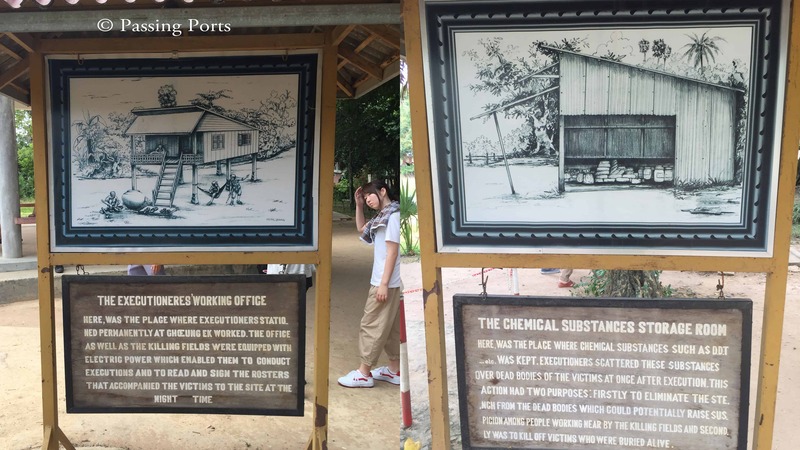 A shed was built in the fields to store DDT, to eliminate the odour of the dead bodies or to burn people alive. There were other rooms meant to store the weapons which were used for killing people. A tree named the Killing Tree stands alone where children’s heads were smashed against its trunk to ensure death. It goes without saying that women were tortured, killed and dumped. Men underwent no less torture before they left this unkind world. Many graves remain untouched while bones and clothes can be seen lying everywhere. The more they dig, the more they discover. You will see a loudspeaker when walking around the Killing Fields. 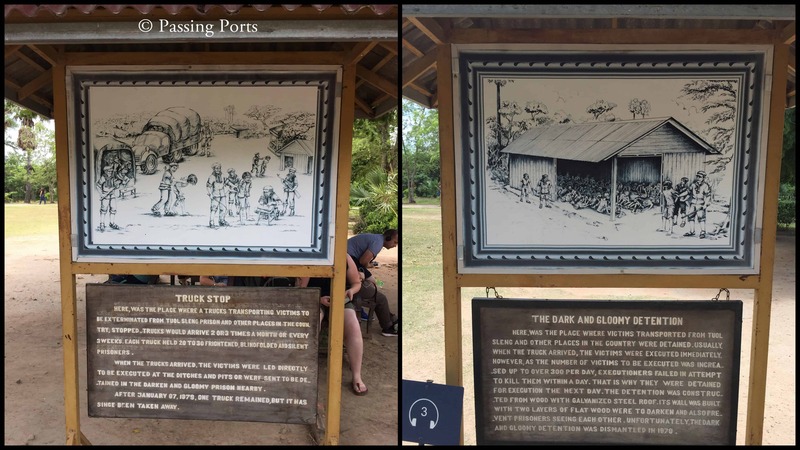 The music played to anyone outside the Killing Fields was soothing, however what was happening inside – I leave that to your deadliest imagination. Soothing music to deceive people outside and hide the screams and sounds of the one getting tortured and killed inside. The stories are unending but I am going to stop at this. I will urge people to go here to know how we as humans have evolved and what the history can teach us even today. The beautiful stupa you see on the picture above is right at the entrance of the Killing Fields. It houses about 8000 skulls – all segregated by gender, age, and method of killing. From the Killing Fields, Narayanan and I proceeded to the Museum of Genocidal Crime. As we were travelling in our Tuk Tuk to our next destination, we spoke a lot about the overwhelming experiences that we just went through and were gearing up for the next. 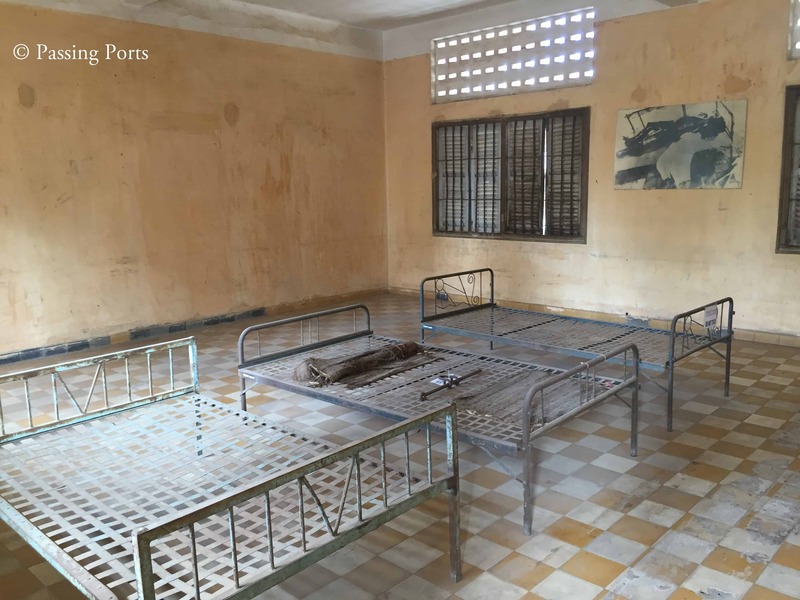 The largest prison under the Khmer Rouge regime was once a high school building. A small cell, a 5 litre bottle to urinate and an ammunition box for defecating was the new life for these prisoners. They were chained inside the cells, made to work when outside and tortured at all times. No one but for the Khmer Rouge personnel were allowed to speak. For the prisoners, taking bath in prison was a faraway dream. Once in a while (anytime between one and three months), water would be sprayed through the windows, and that was their only chance to bathe, to cleanse themselves. The picture above shows the torture beds inside the prison. At the end of all this ordeal, there were seven survivors. Two of them are still alive and you can find them when you visit the museum. I went and bowed down in front of them, an impromptu reaction after learning the true story, a story that had affected every part of my body, every bit of my emotion. 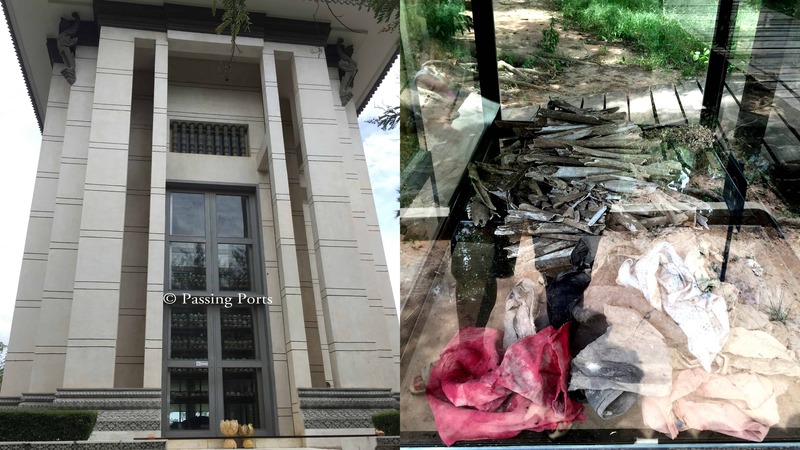 When in Phnom Penh, do take some time to visit these two nightmarish places.